Well, that didn’t take long. In his return to action after more than a 16 month hiatus from the court, Seward County sophomore Niem Stevenson has been named the KJCCC Player of the Week in a league release on Tuesday. 2014 All-American Niem Stevenson came back with a bang for the Seward County Saints on opening weekend 2015, averaging 27 points and 6.5 rebounds per game while shooting 61% from the field in a pair of high scoring Saints wins. Friday in the Saints opener, Stevenson scored 20 points in the first 7:30 of the contest in route to his fifth career 30 point game. Saturday Stevenson wasn’t expected to play as he battled an illness, but he came off the bench for just the fourth time in his career to score 24 points and pull down 10 rebounds in a double-double for the Saints. 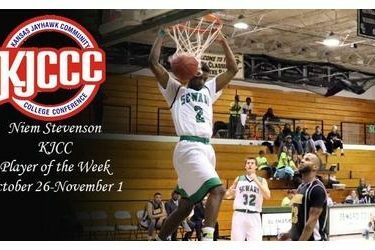 It is the fourth time in his memorable Seward County career that Stevenson has collected Player of the Week honors. Stevenson and the Saints will take their 2-0 record back to the court this weekend in the Greenhouse when they host the Pizza Hut Classic on Friday and Saturday with games at 8:00 both nights.